A couple of posts ago I mentioned that I had something fun to announce. So here it is! I actually entered my work into a gallery show. I found out about it from a friend through facebook, of all things, and thought I'd give it a shot. I have never ever even attempted to enter my work into a gallery before. Mostly because I only made functional pottery and comissioned portraits. Plus I have no idea how to submit art to a gallery. 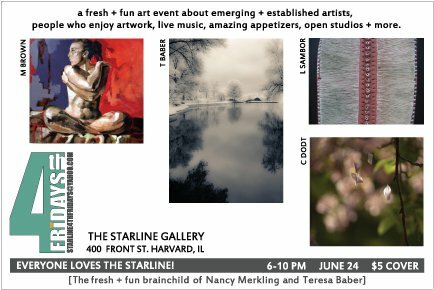 Lucky for me Starline Gallery in the small town of Harvard had open submissions for their 4th Fridays in June.﻿ I submitted five pieces and two of them made it! I think it's a little ironic that the two that made it in were the two I made at the last workshop I attended with Bridgette. I really have no idea what to expect next friday but I get weird little butterflies in my stomach when I think about it. It should be fun and my hubby and a few of my friends are going too. I am looking forward to it! This week I am also hosting the first of three art workshops I am offering this summer to kids around the neighborhood. I plan on doing art projects with them by setting up a space in my basement for about ten kids. I have three different dates with three different projects planned. Hopefully it will all run smoothly. This is a first for me too! I'm excited for you! The art camp at your house sounds fun! I am sooooo going to try to make it to the show. BIG CONGRATS--very exciting! I wish I could come along for those kids art workshops--sounds like great fun! ;o) Happy Summer Days! very exciting to be accepted and to participate in show.